(ROSEMONT, ILLINOIS) – The Cavaliers Drum & Bugle Corps is pleased to announce our 2018 Student Leadership Team! "Since 1948, The Cavaliers have prided ourselves on a culture of leadership development," said Joe Roach, Director of Programs. "For our 2018 season, we have another talented and passionate team of Junior Officers–our term for the student leadership–who have collectively notched more than 30 years of experience with the Corps." "As we take on The Cavaliers' 70th anniversary, I'm honored for the opportunity to guide this group of leaders on our active pursuit of excellence, both on and off the field. With our rich legacy and our alumni, families, and fans all serving as that constant inspiration for the organization, this Junior Officer team will drive our culture of teamwork and accountability, while in turn inspiring our membership to boldly establish the Green Machine's next chapter." "Through my time with the marching arts, I have been involved with many different organizations and have served in many different roles, including performer, designer, and educator. I began my career as a trumpet player at Clear Falls High School in League City, Texas. I marched for three years with that ensemble before taking on my first year of drum corps with The Cavaliers in the 2014. After my first season with The Cavaliers, I returned to Clear Falls High School to finish out my senior year as one of the Assistant Drum Majors. Before the 2016 season, I was selected to serve the Corps as an Assistant Drum Major, and in 2017 I was selected to serve as the head Drum Major. This 2018 season will be my final season with The Cavaliers." "I am most excited for the very first show. There is nothing like it in the world. 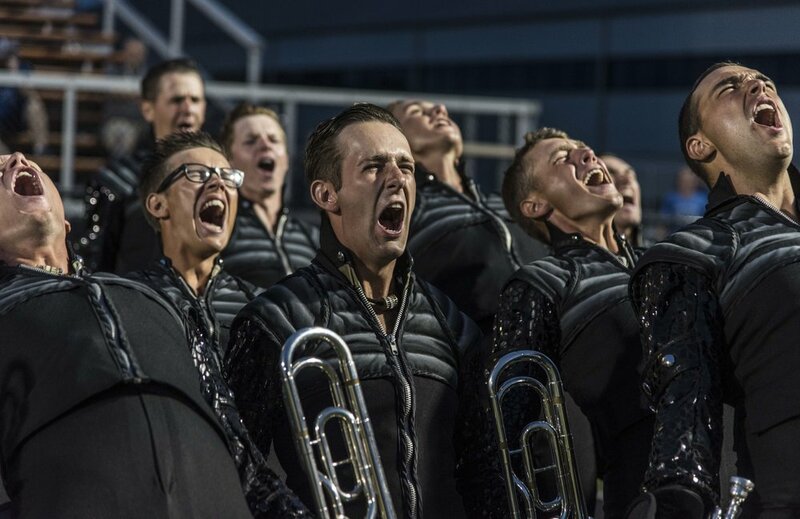 It is the first time that many of the fans will ever see The Cavaliers perform live, and it is such a humbling experience to watch their faces light up with joy after our shows." "I'm a full-time student studying mechanical engineering in my third year at UT Dallas. I've spent the last three fall seasons teaching with the Grapevine High School marching band, and I currently work as a laboratory assistant, studying superconductivity and extreme thermal conductivity. I'm a big fan of coffee, watching movies, running, and biking." WHAT IS YOUR FAVORITE STORY FROM ANY SUMMER? "My favorite story from my time here actually happened last year. At the Atlanta regional, the warmup was located in a wooded area across from the stadium. Here I am, leading the hornline with assistant drum major Luke Stoner through the almost cinematically 'lit' forest and I'm feeling this sense of calm and intense focus coming from our incredible hornline. It was an incredible experience! That moment represented what it feels like marching here at The Cavaliers: having confidence in yourself, your abilities, and taking the time to soak everything in and enjoy the performance." "I'm definitely one of the goofballs of the Corps. I've always found humor in some of the hardest times in my life and on tour. It personally helps me get through hard times. It's not something I actively seek out for attention or anything; it's sort of a knee-jerk reaction to most situations. As I've grown older, I've learned to flip that switch on and off whenever it's appropriate. I've found that learning how to control what some may feel is a sign of immaturity, has ended up becoming one of my biggest strengths as a leader and as a man. I'm excited and honored to jump into the role of Drum Major, as it's going to be a whole new experience for me." "I know it's cheesy, but my favorite memory is every second I am with my brothers. It's so hard to pinpoint and rank exact memories just because the entire Cavalier experience is so life-changing and surreal. I love these moments with The Cavaliers." "I am super passionate about coffee. I work at a local coffee shop and have totally geeked-out over the different ways you can brew coffee, and various flavor notes that arise from the roasting process. I secretly hope to one day own my own coffee shop. Recently, I was named an honorable mention for the Gensler-Brinkmann Design Competition, this is a big honor as more than 500 submissions are accepted. I am also participating in a research study that is observing retail pop-up design and its application in various other fields. In addition to this, I am also working on my honors thesis where I am researching the effects of the commercialization of modernism in pop-culture, and we can create a new language that derived from the understanding and influence pop-culture has on the design field." "The thing that most inspires me are the people that I spin next to. They are my motivation to get out of bed each morning, they are the ones that push me to challenge myself everyday, and they are the ones that teach me how to be compassionate and loving. When we begin talking about what inspires me as a performer, I thoroughly enjoy watching other performers giving their all out on the field, it makes me so incredibly proud to be part of an activity that promotes so much love for one another." "I love to talk and hear about other people's lives, and I also really enjoy meeting new people and hearing their stories. I think every person has a story that deserves to be heard. I have worked for everything that I have. I love animals and my favorite animal is a Penguin. My favorite colors are Blue and Green. I love all kinds of music but my favorite genre is Punk Rock. I grew up skateboarding and I sometimes long board. I love everything about outer space and exploring other universes. I am a Pisces. I enjoy driving around listening to music. The beach is my happy place and my favorite place to be. I really enjoy making other people smile and laugh. Laughing is my favorite thing to do. "I am most excited about helping to push the color guard to new limits. I want us to not only advance our talent on the field, but off the field I want the color guard to have a deeper connection with other members in the corps. Some of my best friends are in the brass or percussion sections of the corps. I'm excited to move-in, start pre-tour, and to have the opportunity to get to know the entire cast of 2018." "I am a musician at heart and enjoy performing, teaching, and breathing music. I love learning about music, watching Thunder Basketball, and traveling around to new places. I also enjoy working out, watching movies, and the college student's best friend: Netflix. I was a Horn Sergeant for the Hornline, and a section leader for the Mellophone section in 2017. Last summer was my first summer in a Leadership role." "The thing I am excited for is how the hornline is going to sound in 2018! The new staff additions to the Hornline are only going to make our success from last year grow. I'm excited for the world to hear our sound this 2018 season." "I am a music education major at the University of Houston where tuba is my main instrument. I am also a member of Phi Mu Alpha Sinfonia where I have served as Historian, Vice President, Fraternal Education Officer, and Treasurer. I enjoy rock climbing, bowling, singing, and playing the tuba." WHAT IS YOUR FAVORITE MEMORY FROM THE SUMMER TOUR? "I have so many good memories, it’s hard to pinpoint just one. However, one of my favorite memories with the corps involves some of my closest friends when we performed in a Disney World parade and got to spend the rest of the day in Disney World." "Along with music, I study philosophy and I try to keep up to date with politics and social issues as much as possible. I am fascinated by human connection and life in itself. I have put on many performances of original music and have successfully worked with other phenomenal musicians.I feel honored to able to work and perform alongside so many fantastic professors that I study with at Indiana University." "My favorite experience from each summer is usually the finals performance. It is the moment you have been working for all summer. You are playing on an extremely high level in front of 25,000 people with your best friends for the last time. It is the pinnacle of not only your musical and physical hard work, but also of your emotional investment into the music and the people around you." "I'm a pretty introspective person. I like to think of new ways to do things and I try not to follow the norm. I don't take anything too seriously and usually I'm quick to make a joke. I marched four years at North Penn High School, three years with the Reading Buccaneers (won DCA Championships all three of those years), and this is my third year with The Cavaliers." "In the marching world, the many years of great Cavaliers before me inspire me to keep the traditions going, as well as thinking about how what I do today will inspire those who come after me. In a greater musical sense, my professor, Ayano Kataoka, inspires me everyday with her ability and knowledge. I love watching her perform because it motivates me to be a better musician."